“Oh, a sarcasm detector. That’s a real useful invention!” – Comic Book Guy. Standout quote. Glad it came in this wonderful season! Plot: Springfield’s culture, never particularly highbrow, hits a low point when a contest asking contestants to embarrass themselves collapses into a full-blown riot. In response, Lisa pens an open letter begging the townsfolk to better themselves. That letter catches the collective eyes of Springfield’s MENSA chapter, who encourage her to join. Despite a bit of terseness in the group, their concerns about Springfield’s culture gain more prominence when they inadvertently cause Mayor Quimby to skip town. Following the town charter, they take over as a quasi-junta. OK, 21 episodes down, two to go in the tenth season. Only took me about two years to do so. And after that complete and utter debacle of the last episode, these next two might close the season out on a high note. Synopsis: Lisa falls ill after being stuffed in a freezer to try and get some ice cream (no prizes for guessing who did it). Rather than study, she gets sucked into a video game, “Dash Dingo”. She gets so hooked into the game, she forgets to read The Wind in the Willows… and comes back to a quiz on the book. (“Game over, mate!”) Bart gets Nelson to hook her up with test answers, and she passes the test at such a level that the state no longer considers the school absolutely pathetic, and is willing to give them money. Meanwhile, the aforementioned fridge-stuffer gets a pet lobster at the same supermarket. By “gets a pet”, I mean Homer prevents Marge from cooking Pinchy, a lobster that the family brought for dinner. Review (SPOILERS): Lisa Simpson is one of the more divisive characters in the Simpsons canon. This stems from the trend during the “double digit” seasons to have Lisa as the mouthpiece for the generally leftish writers, with little reasonable dissent or critique of said positions. While I see where they come from, my opinion of Lisa stems from the early seasons of the show – as it should. And while she did have moments where she seemed overtly opinionated, they were just part of her role as a wiser, more mature eight-year old, who still fell victim to the same weaknesses that eight-year olds have. “Lisa Gets An A”, surprisingly, has her fall victim to a trap that students tend to face – that of cheating. Not a bad idea, although does this episode execute it well? The idea itself isn’t exactly original, per se (“Bart the Genius”, anybody), but the proper tools can make something that seems cliche at first glance come off as rather well-done. 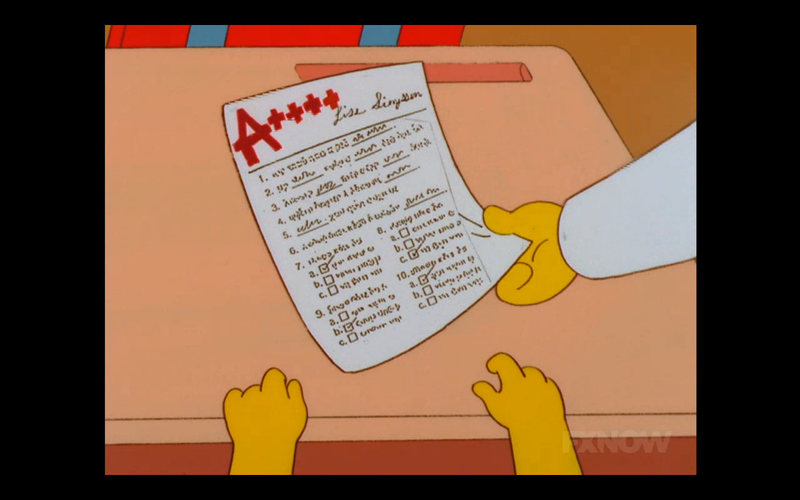 This isn’t just an average kid deciding to cheat because of his or her laziness – this is Lisa Simpson (read, girl who only got one B… so far) getting so sucked into Dash Dingo, that she outright forgot that she had a homework assignment. While one would question this lapse in judgement, I think it works to show that even Lisa isn’t infallible from everyday life. She’s eight years old – she’s going to have those moments where her judgement lapses. It also fits into her perfectionist tendencies. When she got the aforementioned “B” in “Kamp Krusty”, she almost had a meltdown. 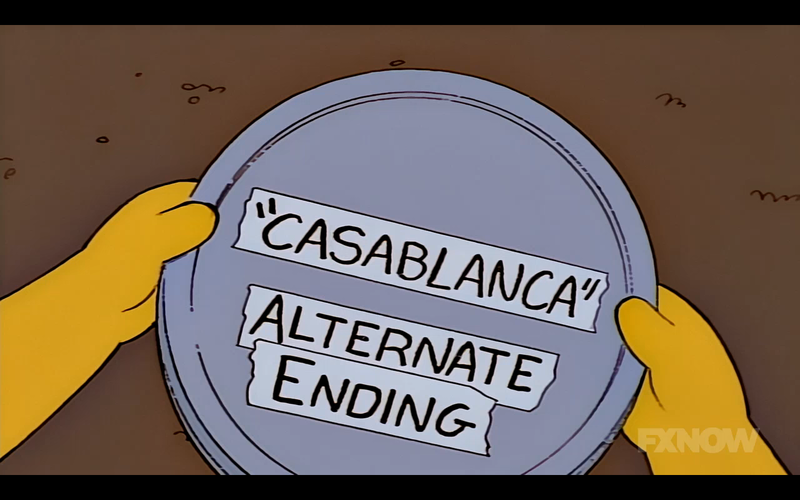 (Yes, I am aware that The Simpsons has a wonky continuity.) Fearing that failing a test would have her banned from Harvard and sent to Brown fits in very, very well – Lisa isn’t the most pragmatic person out there. When push comes to shove, she’s willing to throw her ethics out the window… albeit not willingly. Of course, episodes that focused on characters having to wraggle with themselves on their own failings have been done quite a few times – “Bart the Genius”, again. This episode decides to shift the focus somewhat from “Lisa cheats” to “Springfield Elementary is a cesspool”. Admittedly, this is a bit of a swerve in focus, but it does force Lisa to swallow her ethics even further. The third act is kind of interesting, speaking from the keyboard of an aspiring teacher. The focus on Springfield Elementary’s finances is brought in again – episodes such as “The PTA Disbands” touched on it before. This time, there is an analysis of how financial grants and funds are spent. Springfield Elementary was doing so poorly in terms of grades that they were denied assistance from the state – seemingly keeping the school in a cycle of pathetic academia, technical lag, recreation decay, and funding drought. Yet, when the school gets the grant – $250000 – Skinner proceeds to blow it on scoreboards, outdated tech (even by 1999 standards), and, most damningly, liquor for the teachers. The grant is thus kind of self-defeating, and at best, only serves as a short-term ailment to grave problems Springfield Elementary faces. This actually raises quite a few questions – should education funding be punitive, or should there just be grants for better schools? Should there be more oversight on how the schools spend their funds? Are private resources in schools dubious? “Lisa Gets an A” does a good job at putting these ideas down on the table. Here’s where the episode gets a little wonky. First off, the fact that Lisa’s A+++ managed to get the school a basic grant is a bit out there. 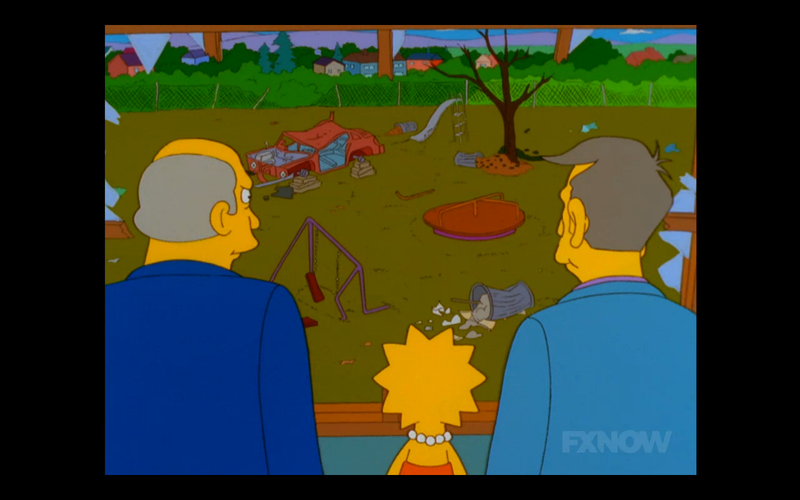 It could work to show just how bad the rot is at Springfield Elementary, but the out there-ness stands. Secondly, there’s the entire concept of how the school was able to pull off a second awards ceremony to throw the State Education Comptroller. Also, the first act of the episode seemed a bit light on the laughs. Not bad, but when you’re focusing more on comedy like Scully seems to be doing, you kinda need the laughs. Before I go… the B-plot. 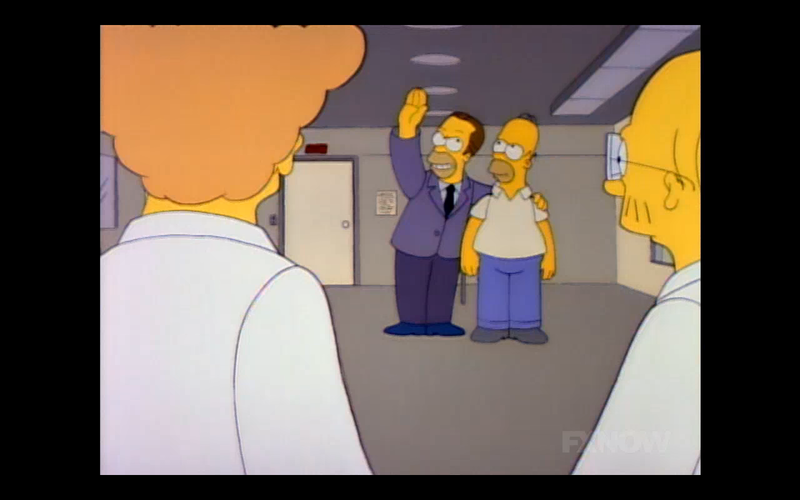 It’s stupid, has Homer as a bit of an idiot… and I love it. 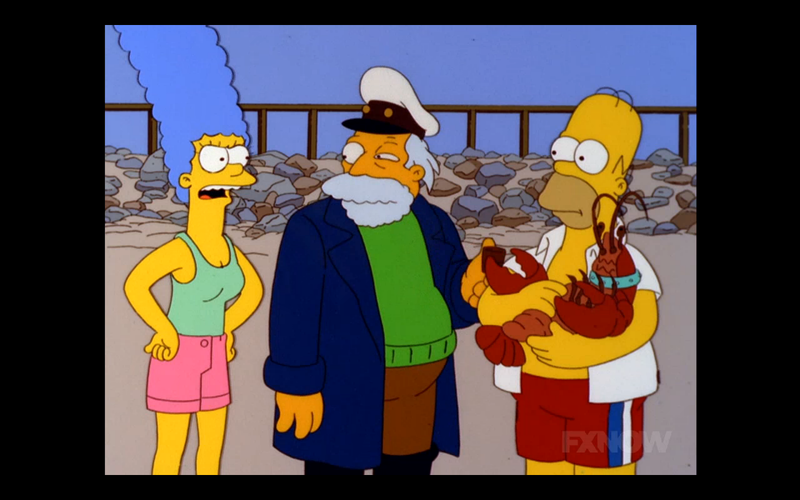 It’s actually a very fun, cute plot, what with Homer coddling his pet lobster and treating it like a dog. That, and the end of that plot is one of the best examples of dark, tragic comedy in the show’s history. Oh, wait, there is “Ken and Harry’s”. 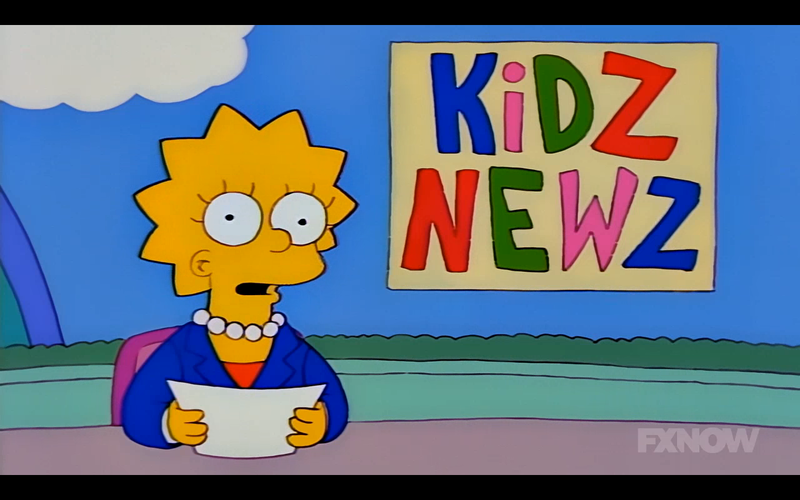 So, yeah, anytime you catch newer Simpsons episodes using “Mapple” and “Funtendo Zii”, this episode has some blame. Zaniness Factor: 1.5 – the third act is a bit stupid, but otherwise, not too bad. Jerkass Homer Meter: 2 – the point is mainly for sticking his daughter in the freezer to get some ice cream, plus the borderline neglect of his kids once Pinchy comes into the picture. Favorite Scene: I loved seeing how utterly decrepit Springfield Elementary is, but the gold moment has to be Mrs. Krabappel using a periodic table provided by Oscar Meyer. Least Favorite Scene: Did we really need to see the entire second grant presentation? Score: 7.5. Would’ve gotten an 8, but the relatively joke-free first act brought it down a bit. Synopsis: While tracking down his middle name, Homer comes across a farm run by two former hippies, Seth and Munchie. Upon learning his middle name, and learning more about his rebellious mother and her interactions with said hippies (she painted a mural with Homer’s full name), Homer takes an interest in the carefree lifestyle of hippies, and becomes one… not understanding that Seth (Martin Mull) and Munchie (George Carlin) have moderated their practices, even embracing the capitalist aspects of the 90s. Review (SOME SPOILERS, POSSIBLY FOR OTHER EPISODES): In hindsight, maybe the 60s counterculture was too good to be true. Intended as an anti-establishment movement meant to get humanity more in touch with Earth and the fellow man, as well as generate social reforms, ironically, not only has it become the defining image of the 60s (to the point of cliche), but arguably became absorbed and moderated by the mainstream itself. Not that this was a bad thing, though. However, there is an irony here. In many regards, The Simpsons was a counterculture in and of itself, or at least represented a counterculture. After the seemingly conservative, politically and socially stolid 80s, where American morals and archetypes were reinforced, came this show that managed to lampoon (if not subvert) every single aspect of Americana. Unfortunately, episodes like “When You Dish Upon A Star” seemed to represent the show becoming mainstream. Here’s where the absorption of the counterculture in the mainstream proved to be detrimental – modern Simpsons episodes seem to run on cliche plots and hackneyed dialogue, attempting to be trendy and cool, and just coming off as a pathetic show that needs to be axed. Soon. Synopsis: Reaching a midlife crisis, Homer becomes despondent on life. After a projector breaks down, Homer rhetorically asks “who invented this thing?” Lisa responds, and Homer has a new goal – be the new Thomas Edison. He becomes obsessed with the man… and, when it turns out that Edison invented something that Homer seemed to invent – a chair with an extra set of legs on hinges – Captain Wacky becomes hellbent on destroying Edison’s chair. Review: Sounds like a Scullyfied Simpsons. Ain’t been reviewed onto nigh for two months. Tsk, tsk, tsk – trouble a brewin! 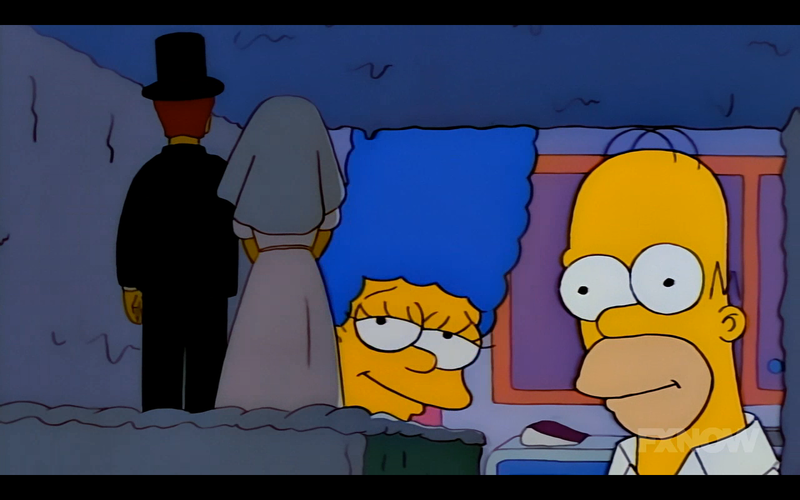 Homer’s sorta pitiful life is the centerpiece of the greatest Simpsons episodes. Even when he is involved in something landmark (such as going into space), there’s this tinge in the writing that he got there by the thinnest of margins (aka, Barney going insane and falling off the top of a mattress factory). Despite this, he almost always maintained a love for the simple things you’d expect a 40-year old to love – TV, Duff, all that jazz. Indeed, deconstructing his simple life by putting him in a midlife crisis seems like tough ground to tread. It doesn’t seem like Homer would be the one to encounter that, but I’d be willing to excuse that somewhat as a deconstruction of what his life has been. Then Lisa brings up Thomas Edison, and the episode becomes… a tad bit more haphazard. 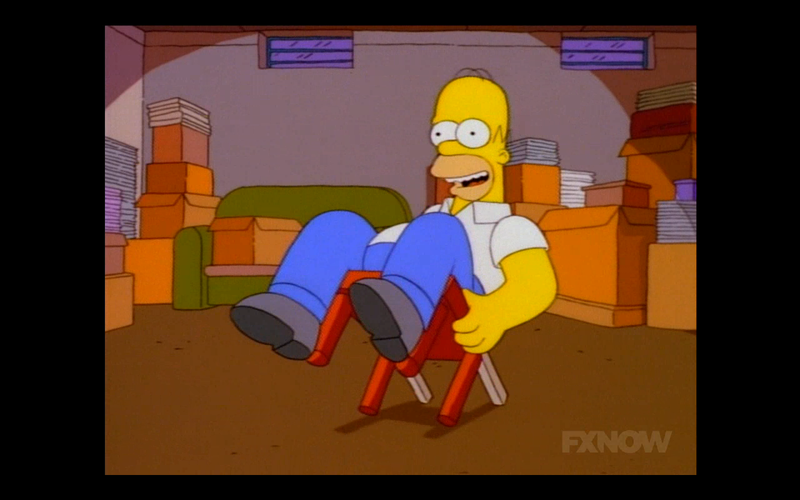 Look, Homer trying to invent something doesn’t seem like a bad idea… it’s just that it was done before. Can you say, “The Homer”? For those unaware, in “Oh, Brother, Where Art Thou”, Homer’s half-brother, Herb, is the founder and head of a floundering car company. 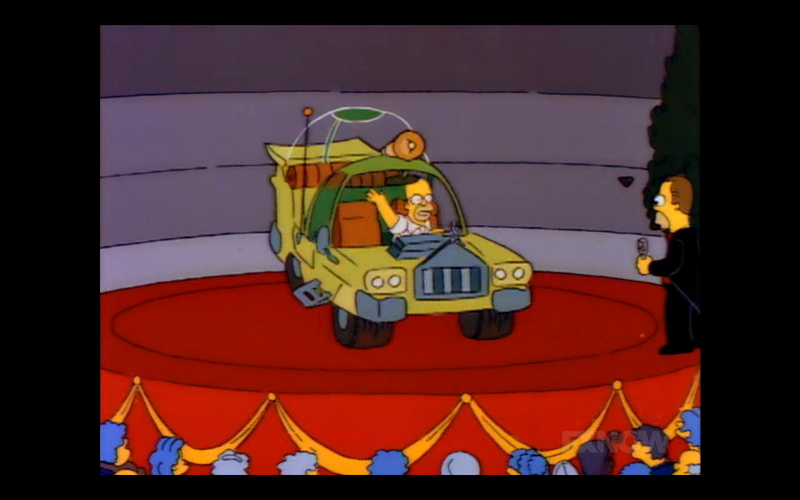 After meeting Homer, he starts to believe/realize his fellow suits are trying to imitate the Japanese and European car makers, and commissions Homer to invent “the American car.” The end result? It cost $82,000 – far beyond the means of the average American, yet even those that could afford it probably wouldn’t touch the car with a 39.5′ pole. Worse, because it was promoted as the flagship/comeback car of the company, Powell Motors loses whatever credibility it had, is bankrupted, and Herb winds up taking residence under a bridge. It was realistic, had a coherent plot, and more than just two-dimensional, satirizing the auto industry and the perceptions of the “average American”. Admittedly, though, the inventions that Homer considers could be taken as a satire on just how insane companies would go in attempts to make lives “simpler”, when in reality, their inventions would add more complications to their life. If you watch The Simpsons for satire, it’s not bad. However, as I mentioned in my discussion for “Oh, Brother”, this show used to do a damn good job at balancing both. Here, the writer decided to focus more on the satire rather than the character, and the end result is somewhat empty. In my opinion, to make a strong script, you need strong characters… and this episode doesn’t really have that. As for the rest of the characters, Marge is reduced to something of a doormat. Ignoring Homer’s wacky desire of the week, she seems to go a tiny bit soft with Homer when it comes with his stupid – if not outright dangerous – inventions. Remember, she told Homer to “shut up” over lack of theatre etiquette in “Colonel Homer”, so this seems somewhat regressive. Bart, meanwhile, seems to act as a mere assistant in Homer’s schemes. While I don’t mind the idea, here, the execution is very dry – there’s little to bounce off each other. 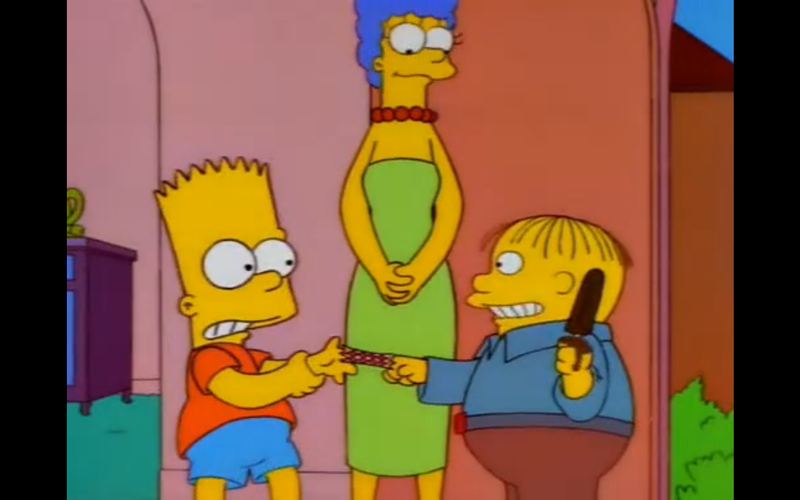 If I can recall, I did sorta like the season 17 episode “We’re on the Road to D’oh-where”, and it was probably because it had Homer and Bart bounce off of each other, and not have Bart serve as a mere sidekick to Homer. Granted, I haven’t watched the episode in a few years, but maybe I’ll check it out one of these days. 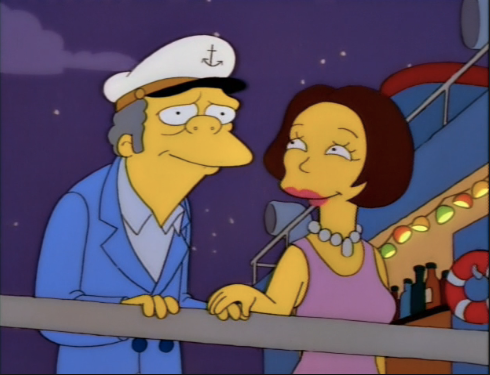 As for the plot… it’s pretty much just an excuse for “Homer acts like an idiot” jokes. The pacing is off, the twist at the end came out of left field, and the second act seems a bit vapid. There’s more I could talk about, but in the end, this is an episode that I have mixed feeling over. It has decent satire, but I feel like it could’ve been better with character exploration – or at least, consistent characterization. Here… not so much. Personally, I found that getting William Daniels – the voice of KITT himself – to be a bad sign as far as character. It makes Homer out to be the centre of the universe, or something to that effect. Homer is supposed to be just this working class guy who occasionally got into strange situations (such as going into space), and who managed to get a realistic response from everybody. Getting KITT reneges on that in a sense. This was also written by John Swartzwelder, well known for his relative reclusiveness amongst the writers. He actually wrote some of the most critically acclaimed episodes of the show – “Rosebud”, “Homer at the Bat”, and all that. He penned “The Cartridge Family”, which was known for it’s relatively neutral stance on Gun Control (Swartzwelder is a conservative, and pro Gun Rights). However, in 1994, he was allowed to submit his drafts from his home, what with the backlash against smoking. Thus, some have speculated that this gave the writers and showrunners free-reign to manipulate the scripts. This was also the first episode to premiere in the 1998-99 season itself – the season that gave us Futurama and Family Guy. Some have speculated that the show’s shift into zanier territory was motivated by Family Guy. The timing, though, leads me to disagree somewhat. Least Favorite Scene: KITT’s appearance, for the reasons above. Zaniness Factor: 1.5 – the half point is for the Homer’s attempt to destroy Edison’s stuff. Jerkass Homer Meter: 3 – was waffling between a 2.5 and a 3, but then I remembered just how boneheaded his inventions were, and the fact that the writers made KITT himself celebrate him, and bumped it up. Score: 6 – mainly for the satire. Character… not so much. Scullyfied Simpsons: Season 9, Episode 16: "Dumbbell Indemnity"
Insert joke about remembering when The Simpsons used to be good here. (Image stolen from Wikipedia). Synopsis: Moe has been entering into something of a depression: he has no companionship. While initial attempts at getting Moe a girlfriend at a local disco ultimately prove fruitless, he winds up meeting Renee (Helen Hunt), a local flower seller, and the two hit it off. When Moe wants more money to keep treating her to the finer things in life, he decides to commit insurance fraud… with Homer as his “guinea pig”. Scullyfied Simpsons: Season 9, Episode 11: "All Singing, All Dancing"
Synopsis: Homer claims to hate musicals, revealing his disdain after renting a musical that Homer thought was a Clint Eastwood western. The rest of the Simpsons note the irony of this, stating the mere fact that the family (and the entire town) tend to break into song on a semi-regular basis. Meanwhile, Snake tries his hand at robbery… and reveals his distaste for musicals. Review: This will be a short one; it’s meh. It’s a clip show; what more do you expect? I’m not really going to go into depth here, though. First, let’s get this out of the way; the clips themselves are sublime. The first eight seasons of the show featured some damn good music. My favorite would have to be a tie between “In the Garden of Eden” from “Bart Sells His Soul” and “We Do” from “Homer the Great”. Now the original material. It starts out great: “Paint Your Wagon” was pretty damn funny. However, by the start of the second act, it runs low on gas. While most of the characters are, well, in character, for some reason, I just can’t see Snake backing off as easily as he does. Maybe it was an attempt at character development. Maybe they just realized they needed something to keep the plot moving. Who knows? It’s also worth noting that not even the writers wanted to do this episode; the ending makes this pretty clear. Worth noting that this episode came out shortly after the release of the CD Songs in the Key of Springfield. Thus, I blame FOX executives for the dryness of this episode. That’s really how to sum it up: it’s just a largely forgettable episode. I’ll give it a pass, but only because it wasn’t as nonsensical as “Miracle on Evergreen Terrace”, and it reminded me of more entertaining episodes. 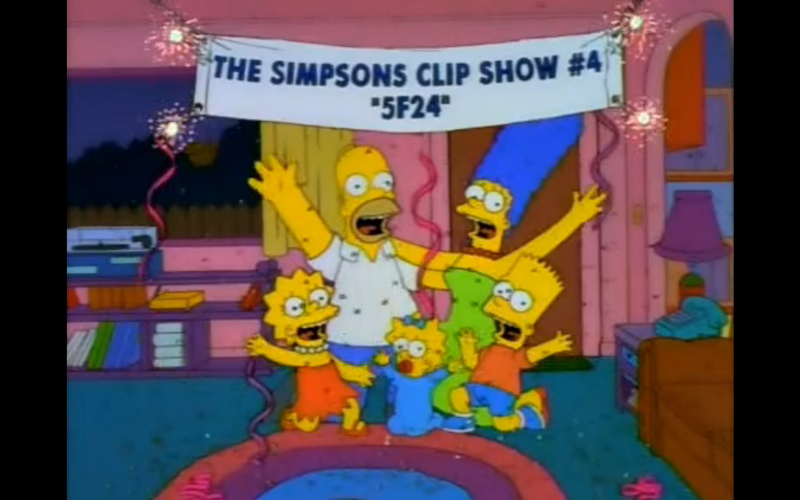 If you want to watch a good clip show, watch “So It’s Come To This: A Simpsons Clip Show”, “Another Simpsons Clip Show”, and “The Simpsons 138th Episode Spectacular”. At the end, a shotgun is fired during the credits. Two blasts are heard on one occasion. Said occasion is when Phil Hartman’s name comes up. Five months and change after this episode aired, Hartman’s wife shot him dead before turning the gun on himself. David Mirkin was credited as the executive producer. For once, Mike Scully is absolved of blame. Favorite Moment: “Gonna paint your wagon, gonna paint it good…” SING ALONG! 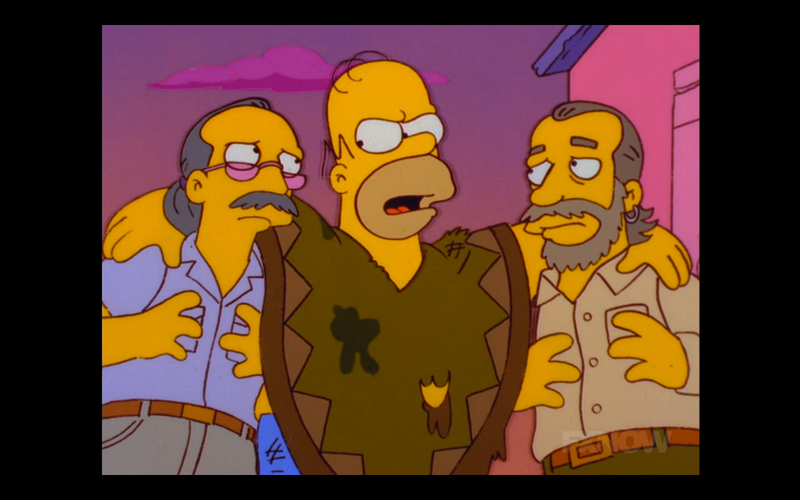 Least Favorite Moment: Snake leaves because he figures that the family would not make good hostages… because they sing. Just seems a bit off for him. Zaniness Factor: 1.5, mainly for the singing. Jerkass Homer Meter: 1. (That’s a first, I think).